Dave Hanron - The Business Outsource Guy: Part 2: "SaaS" vs "PaaS" vs "IaaS"
In my previous segment, we covered a general overview of “Cloud Services”. We mentioned “Public and “Private” clouds, and gave some examples of each type. Software as a Service (Saas) should be a familiar term to many of us. Loads of sales folks lay claim to selling “SaaS” services. But what exactly is that? SaaS refers to a program where the Customer utilizes a platform belonging to a provider (the company who owns the application) which runs on a cloud service infrastructure. A good real world example of “SaaS” would be the travel service provided by Expedia. The consumer goes to Expedia's website and enters information on the destinations, dates, and times for their travel and Expedia’s “SaaS” returns available options to choose from and offers booking capabilities. Zimbra is a type of "Paas"
Platform as a Service “PaaS” is a bit more complex. In “PaaS” a company can create their own applications and merely run them through a provider’s platform. 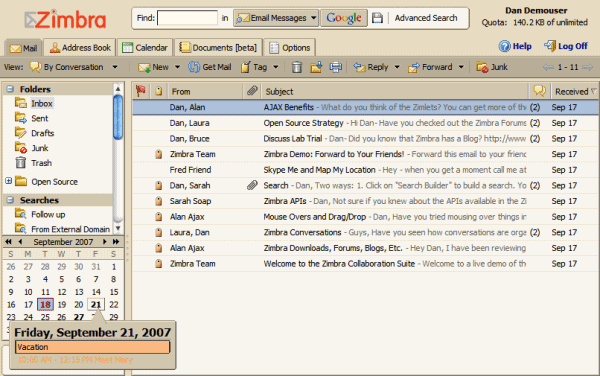 A popular example of a “PaaS” in use today would be Zimbra Desktop which enables a person to aggregate accounts across platforms (like Gmail, Yahoo Mail, Zimbra) and social accounts (like Facebook and Twitter), to make reading and posting information more simple. Infrastructure as a Service (IaaS) clouds are created consisting of virtual machines (servers, storage, routers, firewalls, etc) which are made available to companies on demand to run their own in-house applications. The hardware is housed in a "Data Center". These applications are harder to identify, as one of the main purposes of IaaS is to allow the company to give the impression the platform is exclusive to their company and hosted and maintained by their staff. The major advantage to IaaS is additional servers and storage may be configured in minutes, not days or weeks, and allows almost instant growth of network resources. Multiple platforms can share a single physical server, but be completely isolated from one another, ensuring a totally secure computing environment. The ability to run multiple platforms on a single server creates tremendous cost benefit to a customer. There is little CAPEX (capital expense) associated with additional capacity and the finance department can “pay as they go” for resources (CFO’s are thrilled with this!). With the proper provider, customers can benefit from virtual control panels, firewalls, nearly unlimited storage capacity, and many other features. All this comes with savings in energy consumption, real estate costs, network, hardware expenditures, and dollars spent on IT resources. In the next segment, we will explore the world of “IaaS” in greater detail, touching on additional specifics and overall cost efficiencies available. I’m always available to assist individually should you have “cloud” questions prior to my next entry. Please either email me at dave@davehanron.com or complete my form for “More Information” located on the side of my blog page. If you have any comments or questions, they can also be entered in the comments section below. Good post. But I would recommend this site www.nixsolutions.com/ . Here you can order the software. The guys are working quickly and efficiently. They have a lot of projects. I advise this site. Work on an international level.